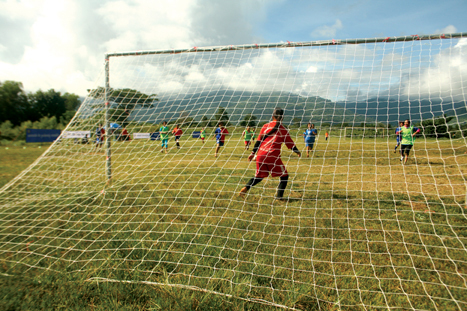 Tired of the over-commercialisation of sport, Mark Bibby Jackson visits a tournament in Pailin, Cambodia that shows that the beautiful game retains its power to do good. As an instructor from the Cambodian Ministry of Education passes the ball to his colleague, a young boy sets off in hot pursuit. His task is hopeless, the ball resting at the feet of its intended target before the boy gets five metres. To the group of young girls and boys sitting before him the instructor explains that the distance between him and his colleague represents the range of a landmine explosion. If this had been a mine or unexploded ordnance, the boy would have lost more than just a race with a ball. We are in Pailin, a remote province in Cambodia close to the Thai border for a mini-football tournament organised by the non-profit organisation ‘Spirit of Soccer’. Several of the girls assembled around us have just played a seven-a-side game before being called over for their mine awareness session. Behind us some boys are playing out another game in the sun while we receive our lesson in the shade. The instructor asks how many people have had members of their family injured or killed by mines. Two small boys stand up and explain that 15 of their relatives have lost one or more limbs from explosions. Spirit of Soccer organises several tournaments just like this each year throughout Cambodia. “Football is like candy, it draws in the children,” explains my host Suon Sokhorn, who has organised today’s tournament, working alongside the Ministry of Education. The list of countries in which Spirit of Soccer has operated in the past 14 years sounds like a roll call of the folly of war – Bosnia, Iraq, Lebanon and Kosova, in addition to Cambodia and now Laos. Spirit of Soccer was born in Bosnia in 1996, when its founder and executive director, Scotty Lee, was in the battle-torn country on a coaching trip organised by Arsenal FC. Three years earlier Lee had helped deliver food and medicine to frontline villages affected by the conflict. On this second visit, he experienced a group of children setting off a landmine while playing a game of football near Sarajevo Airport. Three died and four others were maimed in the explosion. “Sickened by the accident, I devised a way of teaching children about the dangers of landmines and UXO using soccer coaching,” Lee explains. He decided to stay in Bosnia, working with local coaches while seeking support for his scheme. He was down to his last 5 Deutschmark when Unicef came in with some funding. After a short programme in Kosova and a stint in the US, where Lee is now based, to get his ‘A’ coaching licence, Lee returned to Bosnia in 2003 for a further three-year programme. The Cambodia programme started in 2004. It was during his second stint in Bosnia that Lee came up with what he now calls “the Spirit of Soccer blueprint” of training local coaches to take over the programme. Working with the host ministries of education and sport, the local football federation and the national mine action centre, Lee selects teachers to be trained as ‘D’ licence coaches. These are then sent out to the schools and football clubs that have the highest rates of landmine incidents, to roll out the programme of football and mine awareness education to children. This blueprint has proved a success. In the 14 years since Spirit of Soccer was conceived approximately 100,000 children have gone through Lee’s programme globally with only one recorded incident; that in Cambodia two years ago, when a young boy lost his hand picking up a grenade. Overall, landmine incidents have decreased substantially in the areas where Lee’s organisation works. In Cambodia, the mine casualty rate for children fell from 140 in 2006, when the programme commenced, to 78 last year. Lee is quick to stress the “small part” that his organisation plays in the overall process, emphasising the pivotal role of mine clearance organisations in making the land safe. However, Spirit of Soccer is key in getting the message of the dangers of playing with unexploded ordnance across to children. The organisation was recognised at the Beyond Sport Awards in London in 2009, where Lee was presented with the ‘Most Courageous Use of Sports’ award by Dame Tanni Grey-Thompson, an athlete that Lee greatly admires. Lee says that Spirit of Soccer has always been based on conflict resolution. “Then we go to what we share,” he says, namely a love of football. He cites one example in 2008 in Baghdad as proof of the sport’s healing powers. With echoes of the famous occasion in the First World War when soldiers from the Germans and the Allies left their trenches to play football in no man’s land on Christmas Day, Lee explains how he challenged a team of Turkish drivers to a game of football with his Shi’ite security guards. In the middle of a country where there was no law and order, they played out a game that was self-refereed. If the ball was out, the ball was out, and nobody went in over the top. “If for example we can take the children from Baghdad to another place by concentrating on the game instead of the violence around them, then we are doing something worthwhile,” he says. Smiles are very much in evidence on our ad hoc football pitch in Pailin. Even those on the receiving end of a drubbing appear to be enjoying the occasion. In countries like Cambodia and Iraq, children simply don’t have opportunities to play. For Rachel Haig, who helps run Spirit of Soccer in Cambodia, merely giving children this option is reason enough for the work of Spirit of Soccer, regardless of the educational value of the programmes. Last year, Haig took a Cambodian team of four boys and four girls to the ‘Football For Hope Festival’ in Johannesburg, that coincided with the World Cup. Open to any organisation that incorporated football into programmes for social change, in total 32 teams played in the tournament, including a united Ireland team and a combined team from Israel and the Palestine. Often playing against opponents much bigger than them, the Cambodian team only managed to win one of their 10 games, beating England 1-0, but they did not return home empty handed. They won the Fair Play Award, voted by their opponents after the end of every game. Buoyed by this success, the team has returned to Cambodia to act as ambassadors for Spirit of Soccer. On our morning in Pailin, a boy and girl who went to South Africa tell all the other boys and girls of their experience, and of the importance of discipline, teamwork and saying no to drugs. The latter is a new message that Spirit of Soccer is trying to roll out to children, particularly those in more urban areas where drug abuse is a growing issue. Once again working with the local ministries, Lee’s team have trained several police officers as football coaches. In a country where the police are often derided as lazy and corrupt, the programme provides them with the opportunity of regaining some respect within the community. Messages in Khmer stating: “Do sport, not drugs” and “Abolish, drugs, violence and crime”, are strung up around the pitch in Pailin. With all the money in football these days, it is sobering to discover that Spirit of Soccer’s programme in Cambodia is run on just US$130,000 per year, that’s less than half what Wayne Rooney earns in a week. The English Premier League seems a million miles away from a small field in Pailin. Their lessons learned, the children are free to play the beautiful game again. Here the smiles are genuine and the play is fair. The game the world loves is played both according to the rules and the spirit of football.